Good Morning, this is Capital Essence’s Market Outlook (the technical analysis of financial markets) for Monday December 3, 2018. We’ve noted in the previous Market Outlook that: “S&P turned indecisive near key technical resistance. Our near-term technical bias on the index favors a short-term consolidation. However, the overall technical backdrop remains bullish so pullback should consider as buying opportunity and not chances to take profit or get out.” As anticipated, stocks hovered near their flat lines in afternoon trading before a report indicated a Chinese official saying that there are points of consensus between the U.S. and China on trade. The S&P finished strong with a gain of 0.8 percent to close at 2,760.17. The Dow Jones Industrial Average gained 0.8 percent to close at 25,538.46. The Nasdaq Composite also rose 0.8 percent to close at 7,330.54. The CBOE Volatility Index (VIX), widely considered the best gauge of fear in the market, fell nearly 4 percent to 18.07. Transport stocks had a great day with the Dow Jones Transportation Average rising 1.3 percent amid recent decline in oil prices. The iShares Transportation Average ETF (IYT) rose 1.32 percent on the day and is up nearly 2 percent YTD, slightly underperformed the S&P. Now the question is whether the rally has more legs? Below is an update look at a trade in IYT. Our “U.S. Market Trading Map” painted IYT bars in green (buy) – see area ‘A’ in the chart. The first dominant feature on the chart is the rising trend starting in early 2016. The second dominant feature of the chart is the downward trend since September 2018, which represented the digestion period. The correction found support near the 38.2% Fibonacci retracement. Last week’s rally pushed the EYF above the 1-year moving average. That level was significant when IYT fell below in mid-October. It’s now acting as important support. This is a positive development, signify a bullish reversal and upside breakout. Right now follow-through is the key. A close above 194 this week will confirm the bullish breakout and has measured move to around 209, or the prior high set in September. 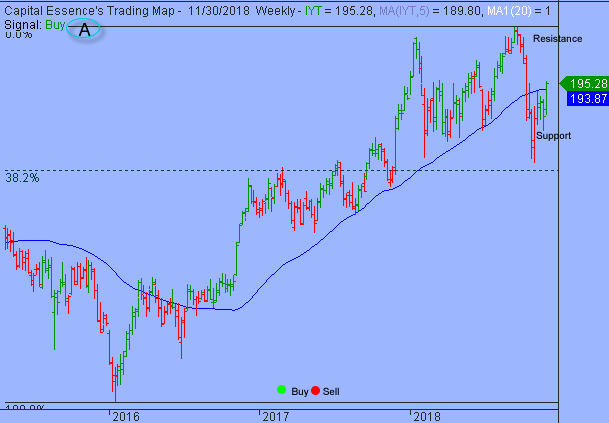 IYT has support near 182. Short-term traders could use that level as the logical level to measure risk against. Short-term technical outlook remains bullish (buy). Last changed November 27, 2018 from bearish (sell) (see area ‘A’ in the chart). S&P moved up to test resistance at the trend channel moving average after the November selloff found support near the October low. There is a distinct possibility that a W-shape pattern is currently setting up in the daily chart of the S&P. This pattern is a formation comprising two lows separated by a peak. Those lows occurred in October 29 and November 23 at 2603 and 2631 respectively. The peak occurred in November 17 when the S&P hit an intraday high of 2815 then sold off. In the W-shape bottom, the S&P would have to move above 2815 and then use that level as the new support level for the uptrend rally continuation. Momentum indicator shifted higher from near overbought zone following last week’s massive bounce, allowing additional upside probing. Nonetheless, Money Flow measure is still below the zero line, indicating a negative net demand for stocks. This could put a cap on the upside. 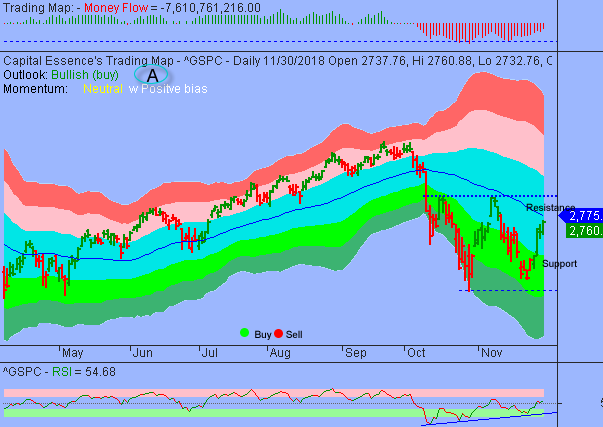 Over the next few days, the most important thing to watch is the rally and retreat behavior as the 2775-2815 zone, or the trend channel moving average and the November recovery high, is tested as resistance. A close above 2815 signify a bullish breakout and setting the stage for a rapid advance toward the prior high set in October. Short-term trading range: 2700 to 2780. S&P has support near 2720. A close below that level has measured move to 2700. The index has resistance near 2775. A close above that level could trigger acceleration toward the 2815 zone. Long-term trading range: 2660 to 2930. S&P has support near 2750. A close below that level on a monthly basis has measured move to 2660. The index has resistance near 2840. A close above that level has measured move to 2930. In summary, there is a distinct possibility that a W-shape pattern is forming in the daily chart of the S&P. The pattern it is characterized by positive momentum that bode well for a breakout in the days ahead. We would add upside exposure once the S&P clears 2775 because it would affirm the buy signal that is in place per our proprietary indicators.